Composed by Linda Spevacek. Choral. Sacred, Christmas. Octavo. Heritage Music Press #15/2111H. Published by Heritage Music Press (LO.15-2111H). 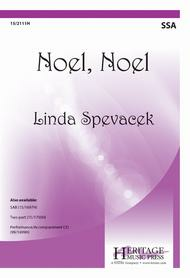 The ladies choir is thoroughly enjoying rehearsing this piece ready for the Christmas Celebration. Great for a simple arr. - sounds more intricate than difficult - love the flute part! November 15, 2007 Wonderful piece! A very satisfying well-crafted song that everyone seems to like.